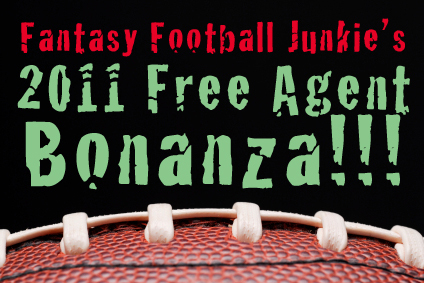 With so little time before camps and pre-season starts, it might be hard to keep track of all the free agent moves that matter toward your fantasy team. No need to fear, the Junkie is here to help. Here are some of the more fantasy related transactions that have occurred. Make sure to update those sheets you bought from the magazine rack! I’m just going to list the player with their new team. Nnamdi Asomugha CB – Philadelphia Eagles ANALYSIS: Should make the Eagles D a top 5 contender, which makes everyone on offense a little better. Kevin Boss TE – Oakland Raiders ANALYSIS: I would upgrade Boss’s value a bit with this move. Oakland will most certainly get the ball to Boss more than the Giants. Steve Breatson WR – Kansas City Chiefs ANALYSIS: Lets see if he can be the man opposite Bowe. Ronnie Brown RB – Philadelphia Eagles ANALYSIS: Probably hurts LeSean McCoy’s value a bit with a proven Brown coming in, but it’s just more talent for the Eagles. Reggie Bush RB – Miami Dolphins ANALYSIS: Should pair well with rookie Daniel Thomas and might start initially. Braylon Edwards WR – San Francisco 49ers ANALYSIS: I don’t like it. Edwards has talent but a big ego to stroke and a penchant for dropping easy bombs. Crabtree is still the one to own in SF. Albert Haynesworth DL – New England Patriots ANALYSIS: Could improve defense, giving more opportunities for Brady and co.
Tim Hightower RB – Washington Redskins ANALYSIS: Leaving one crowded backfield for another doesn’t help Hightower’s value. Tarvaris Jackson QB – Seattle Seahawks ANALYSIS: Will not have Sydney Rice and Mike Williams, two big targets. Michael Jenkins WR – Minnesota Vikings ANALYSIS: Should give McNabb a decent target opposite Harvin to catch passes. Chad Johnson WR – New England Patriots ANALYSIS: Will Tom Brady and Co. help resurrect #85 like Randy Moss? Kevin Kolb QB – Arizona Cardinals ANALYSIS: Should elevate the status of Larry Fitzgerald a bit, but he was going to get production no matter who was behind center. Quintin Mikell S – St. Louis Rams ANALYSIS: They had a surprising year on defense and should benefit greatly with the addition of Mikell. Zach Miller TE – Seattle Seahawks ANALYSIS: Another pickup for Pete Carroll and the Seahawks, Miller’s value might go down a bit. Sadly, I might have to upgrade Tarvaris Jackson, but I don’t like it one bit! Greg Olsen TE – Carolina Panthers ANALYSIS: Should be glad to leave Mike Martz in Chicago. He will be much more appreciated in Carolina and by Cam Newton. Mike Sims-Walker – St. Louis Rams ANALYSIS: If he can stay healthy, could give Bradford enough fire power to turn a better than expected second year. Brad Smith – Buffalo Bills ANALYSIS: If the Bills plan to use Smith like the Jets, he might hold some value in leagues where you are given return yards to individual players. He also, ran the ball out of the wildcat formation effectively. Steve Smith – Philadelphia Eagles ANALYSIS: The Giants waited too long to sign the former pro bowl receiver. He won’t start the year playing but if he comes back healthy, the Eagles are that much better mid-season. And it gives them some more depth just in case Maclin or Jackson go down. Darren Sproles RB – New Orleans Saints ANALYSIS: The new Reggie, should help Sproles increase his numbers this year. Will be moving him up my rankings a bit. Cadillac Williams RB – St. Louis Rams ANALYSIS: Not a great pick for the beginning of the season but if anything happens to SJAX, the Cadillac is going to be a waiver wire stud. In the meantime, he may be in on 3rd down duty to spell Jackson more to keep him fresh. Roy Williams WR – Chicago Bears ANALYSIS: Reuniting with Mike Martz might just be what Roy needs. He’s been a shadow of himself since he and Martz separated in Detroit. Nice work! I’ll most likely share your posts with my audience. Thanks for posting these updates. Thanks John, appreciate any sharing of the site!